So, I have a 2005 2.7 Boxster.Towards the end of the summer last year(Sept), the roof got stuck half up and half down. No noise - ie no worrying noises, just wouldnt do anything! Left it overnight, and huge relief when close fine the next morning. It had been temperarmental before, but always operated in the end. It has never made any odd noises, smells or anything like that. Stupidly left it over the winter and just dare not try to operate roof as nowhere secure to leave it if it stopped mid operation. So I tried it today... and nothing. Windows did not go down when I flipped the lever on the roof, and no noise at all when operating switch to bring roof down. The car has only done 40k miles . Any ideas - would be very grateful! The "temperamental" nature of the problem that you describe points to either bad/degraded connections at a number of possible points, or a hairline crack at the parallel strips microswitch inside of the convertible top latch assembly or a deformed plunger-type microswitch, also inside that latch assembly. You must first verify that the parking brake light on the dashboard is actually lit up when you pull up on the parking brake. Then double check that your fuses at B6 (supplies power to the convertible top double relay) and at D3 (supplies power to the convertible top motor) are intact AND that there is no corrosion at their respective spades on at the female receptacles on the fuse panel into which they are pressed. You can clean up any corrosion in those areas with a small piece of fine emery cloth. Next, double check for and clean up any corrosion on all of the male spades of the convertible top double relay, and the same for the female receptacles in the relay tray that accept the double relay spades. You can also tap the double relay on the ground a couple of times sharply, as that sometimes "revives" a sticking relay. If you have done all of the above and still get no reaction at all, you can then move to the convertible top latch assembly and its two microswitches. When you unlatch the top, the latch releases the plunger type microswitch inside the latch assembly and that causes it to ground. When it is grounded, a signal is sent to drop the windows about 4 inches. Poke your finger or a pencil eraser into that depression in the latch assembly and see if you get any reaction from the windows. If you don't, you will have to open up the latch assembly to access the two microswitches. Wow, thanks! It (hopefully) sounds less pricey than a new motor... My fuse box diagram is missing off the fuse box - its 2 am ish in the UK, so will look tomorrow - but do the fuses have the names written on them when I remove the exterior cover? Oh, and parking light def on. Helen (Slightly Inept Porsche Owner)! The fuse tray is labeled with numbers 1 to 10, running from left to right, but the numbers are tiny. (Click on the photo and you can see the numbers). Row A is the topmost row, and Row B is below it, down to row E at the bottom, with a row of spare fuses beneath row E.
Note that this photo of the fuse tray is of a U.S. car, so I don't think that you will have the "dead pedal" there on your car. Also, here is a photo of the the location of the double relay, located above the fuse panel and towards the front. We need a much higher resolution photo of your fuse panel. My photos are from a 986, but I think that as of 2005, the top row is now for spare fuses, the gripper tool, and for the emergency unlocking of the front luggage compartment. 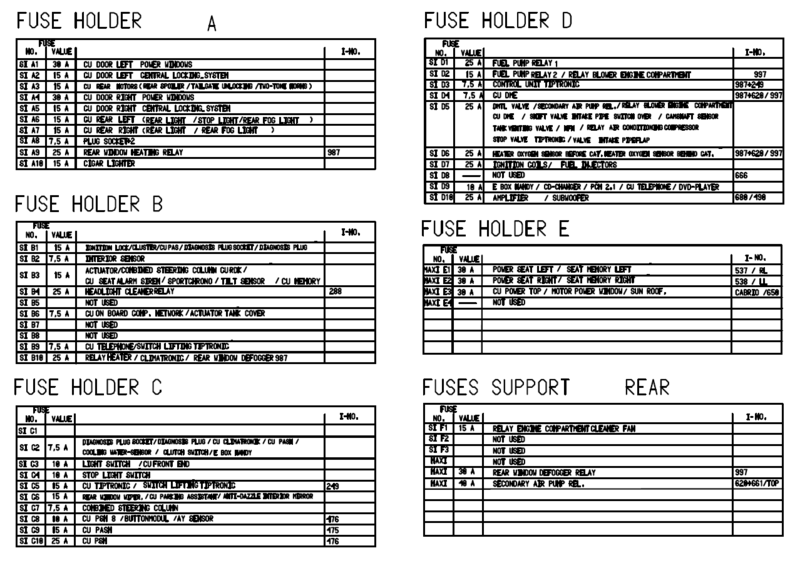 Perhaps somebody here with a 987 can post a pic of their fuse panel diagram from behind the fuse panel cover. 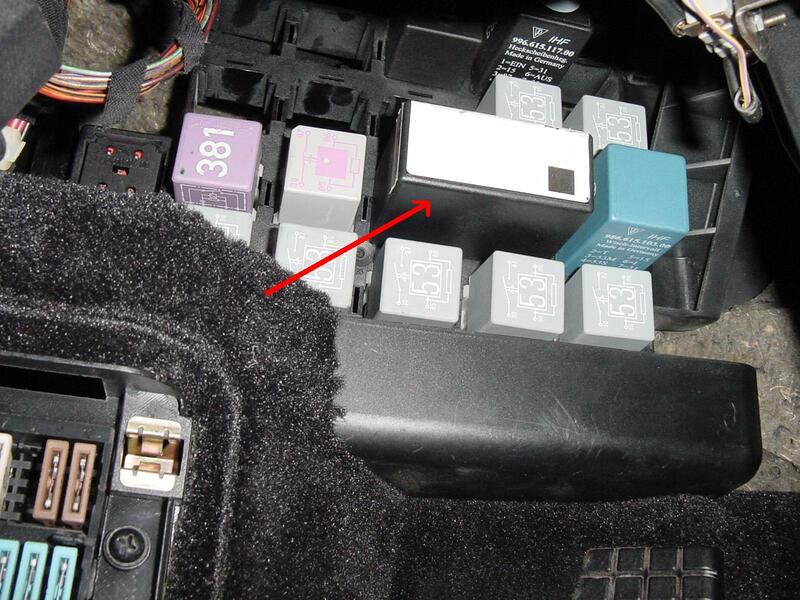 If your fuse panel is on the left side kick panel of the car, the relay tray with the convertible top double relay will be above the fuse panel. The convertible top relay is the only double relay in the tray. My 987 fuse box has a small booklet that tells you what each fuse is for and it has clear identification on what each fuse is for. Check with the small booklet. See post #3... Helen's fuse box diagram is missing from her car. Scanning and posting the diagram would be appreciated. Thank you so much! I think the fuses are fine on inspection. Car is in for MOT this weekend, so getting them to look at it - will at least sound like I know what I am on about thanks to you guys. Anybody got a picture of the location of the relays? I think the pictures in this forum is from a 986.. I have checked the fuses and all microswitches but the sunroof is still dead so I guess it must be the relay. I know this thread is old, but... where is the relay located for Boxster 987????? I am reasonably certain that the relay for a 987 is in the same vicinity as that for a 986. Take a look in the kick panel to the left of your left calf when you are sitting in the driver's seat (If your steering wheel is on the right because it is a British version of the 987, take a look in the kick panel to the right of your right calf as you are sitting in the driver's seat). 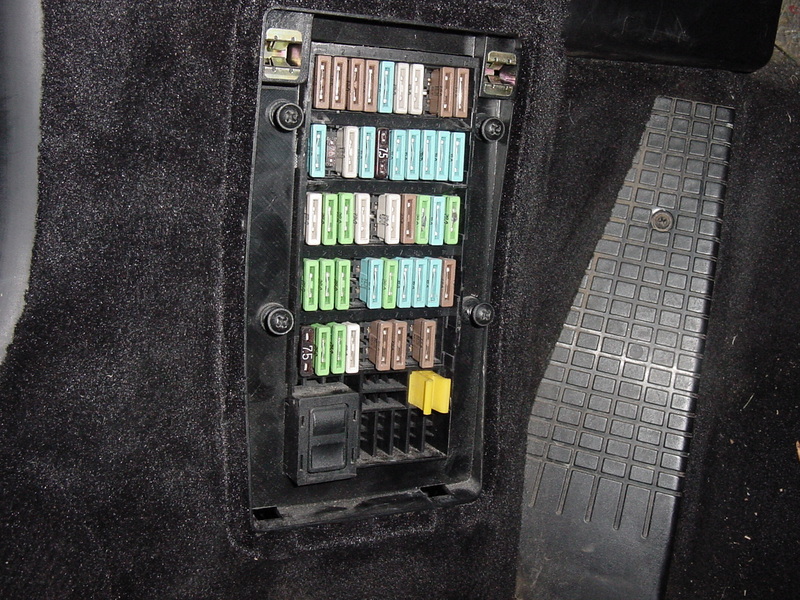 Once you remove the small carpeted panel, you will see all of the fuses in the fuse panel. Directly ABOVE the fuse panel is the relay tray. The convertible top relay is the only double relay in that tray. 987 no longer uses double relays for roof control, but two ordinary, one for up and one for down. The same position as i remember correctly.